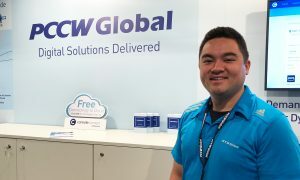 Hong Kong-based international telecom company PCCW Global may not have had a specific product or service to roll out at this year’s IBC Show, but it had an important message for the event-production world: the way you approach IT connectivity is due for a change. The company’s newest offering, Console Connect service is a global, software-defined interconnection platform providing direct connectivity to a multitude of locations (PCCW’s backbone connects 3,000 cities across 150 countries). PCCW Global acquired this software from an Australia-based company and is not integrating it into its robust network. The marriage allows the flexibility of dialing up/down high levels of connectivity for a short period of time. The service was originally designed for network engineers in a raw IT environment. However, the flexibility of the connectivity unsurprisingly has piqued the interest of event producers for use in delivery, especially in sports. Instead of leasing connectivity in 24-month contracts, broadcasters can bring connectivity up and down as needed. If you are interested in learning more about PCCW Global’s approach to IT connectivity, register to attend SVG’s TranSPORT conference on Oct. 16. The company will offer a Case Study presentation on these services as part of the event’s agenda.